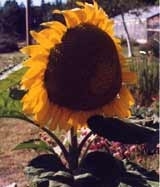 Helianthus annuus - Grown by natives and settlers alike for seeds, fibre and fodder, their wide sunny faces have always been a welcoming sight. Country fair sized - some up to 30 cm across. Note how the ripe seeds form a perfect spiral pattern in the flower�s centre. Ht. to 2.5 m N.